This branch name, registered in August of 1980 (via Ansteorra), was updated to Loch Soilleir, Barony of in April of 1992 (via Ansteorra). This branch-name was registered in April of 1992 (via Ansteorra). Per fess wavy argent and vert, a sea-serpent in annulo, head in chief, counterchanged, in base a laurel wreath argent. Argent, on a pile throughout vert a sea-serpent in annulo vorant of its own tail argent. This order name was registered to Loch Soilleir, Barony of in April of 1992 (via Ansteorra). (Fieldless) A sea-serpent in annulo head to chief and vorant of its own tail vert. Per fess wavy argent and vert, an otter embowed vert and a salmon embowed contourny and inverted argent. This name was referenced in January of 2003 (via Ansteorra) in a registration by Loch Soilleir, Barony of. 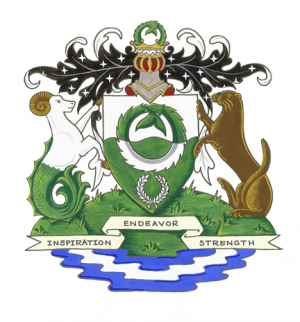 Vert, two arrows inverted in saltire within a sea-serpent in annulo head to chief and vorant of its own tail argent. Vert, a needle and an artist’s brush in saltire within a sea-serpent in annulo, head to chief and vorant of its own tail argent. Vert, two swords in saltire within a sea-serpent in annulo head to chief and vorant of its own tail argent. This name was referenced in March of 2001 (via Ansteorra) in a registration by Loch Soilleir, Barony of. Vert, a horseshoe within a sea-serpent in annulo head to chief and vorant of its own tail argent. This name was referenced in November of 1988 (via Ansteorra) in a registration by Loch Soilleir, Barony of. Vert, an Irish harp argent, stringed Or, within a serpent in annulo, head to chief and vorant of its own tail, argent. Argent, a goutte azure within a sea-serpent in annulo head to chief and vorant of its own tail vert. Argent, a tankard sable within a sea serpent in annulo head to chief and vorant of its own tail vert.